The Division of Basic Research employs advanced methods in molecular biology and genetic analysis to characterize the genes which are useful for breeding and improvement of crops. Ongoing researches focus on elucidating the molecular mechanism of agronomically important genes, developing DNA markers for accurate and rapid selection of useful traits, and facilitating the efficient and extensive utilization of these strategies among researchers and breeders nationwide. In addition, we are developing various materials indispensable for breeding, and contribute to the breeding of innovative varieties that meet the specific needs of both producers and consumers. We are elucidating the "omics" information of various via profiling of the transcriptome using the genome sequence information, and the proteome information by comprehensive analysis of proteins. 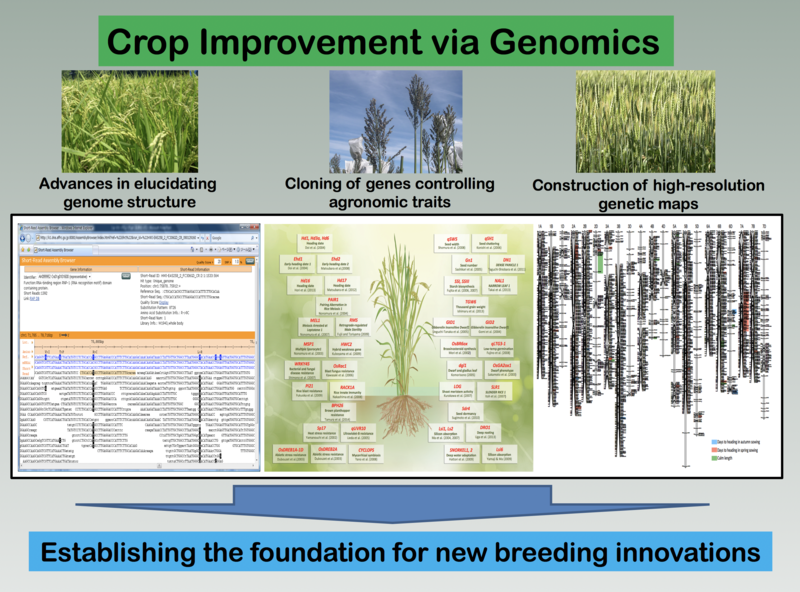 These "omics" information will be used to predict the growing state of the crop and develop indices necessary for breeding selection. We are also advancing the rapid development of genome-wide DNA markers particularly for crops with relatively insufficient genome information such as wheat, and developing techniques to enable large-scale genotyping and efficiently mix genome in self-fertile crops. In addition to constructing the system, we will develop a new breeding method for complex agricultural traits which involves large number of genes, and techniques for selecting excellent crop cultivars by genomic selection using advanced information analysis technology.